On Chesil Beach is a film both beautiful and heartbreaking. It has a poignant lyricism, aided by stunning cinematography and the careful balance of sound and silence. 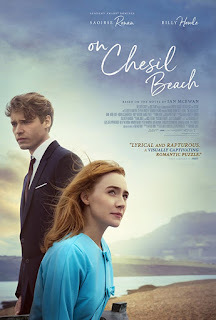 Saoirse Ronan and Billy Howle deliver stellar performances of great emotional depth that had me in tears by the final scene, while the plot offers a thought-provoking study of how anger and hurt can make us oblivious to the possibility of change and acceptance. The score plays an important role in this film, and I loved how perfectly the music reflected the mood and personality of the two main characters. This is not a happy movie; however, there is a sense of sad reconciliation by the conclusion, and I certainly think it's a piece that will stand up to repeated viewing. It's one of those where you'll take away something different from it each time. This is one for fans of deep, emotional drama. Thanks to Palace Nova for the free reviewer's ticket to this film.